There are dozens of reasons a nonprofit may decide to part ways with its fundraising agency, and inevitably when the decision is made, it’s for a combination of them. Reasons range from big to small and – truth be told – right to wrong. But the truly big and right reasons boil down to just four. Be sure to pay attention to these key considerations in judging whether your agency is on the job, or out of one. 1. Your agency is not willing to compromise, ever. Your business relationship with your fundraising agency is just that: a relationship. And successful relationships mean compromise. Is your agency open to discussion on project budgets? Are they willing to try doing things a different way? Will they revisit their fees with you even if you’re in the middle of a one-year contract? You should be able to talk about anything with your agency, and your agency should approach your ideas and needs with a spirit of sensible accommodation. Remember however that your relationship with your agency is a two-way street. 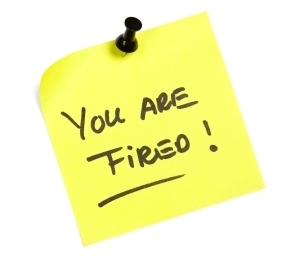 If you are not willing to listen and compromise, you might find yourself getting fired by your agency. Because fundraising firms are a relatively small and specialized breed of marketing agency, most don’t have dedicated sales departments for drumming up new business. In fundraising agencies, it’s often actual senior account people, along with executive staff, that pitch new accounts and win your trust – and business. So when the star fundraising strategist who sold you on the agency never writes, calls, or shows up at meetings anymore, and you’re left with junior staffers who just don’t inspire your confidence, it’s time to rethink whether the agency deserves the privilege of your organization’s business. 3. Your results aren’t as good as they can be. Kirk’s demands for seemingly impossible feats of engineering and medicine drove poor Scotty and McCoy to routine desperation on Star Trek. But they always pulled through because although ambitious, Kirk knew what results were possible. In the fundraising universe, good results mean strong analytics, strategic planning and creative, as well as healthy client-agency collaboration. If your agency is giving you all they’ve got, and you have good reason to believe all they’ve got isn’t good enough, then you should think about whether they’re the right agency for you. 4. You share your concerns – and your agency doesn’t address them. When your agency isn’t living up to your reasonable expectations, it’s your job to let them know right away what isn’t working and to give them constructive feedback on how to address your concerns. When problems are addressed early, they can almost always be resolved easily. But if left unattended, little issues have a way of multiplying and becoming much harder to resolve, usually to the detriment of your program. You also need to be prepared to turn a critical eye to your own organization. Are there ways in which your organization is contributing to the less-than-stellar working relationship? And how can you support a stronger client-agency relationship through changes on your end? Your agency’s job, in turn, is to listen to you and make real efforts to address your concerns. The best case scenario is they do, and you get back on track with a mutually rewarding partnership that engages donors and raises critical funds for your organization. But even if they don’t, the worst that will happen is you will part ways and develop a new agency partnership that works better for you, your organization and your program. A lot of factors go into year end fundraising success: targeting, message, strategy, the economy, and current events, to name a few. These are big, important, perhaps even daunting, components of how well, or not, your year end campaigns turn out. But another predictor of success in year end fundraising – and one of the most significant ones – is a rather practical matter, and completely within your control: when you start working on your year end campaigns. “I’ll get to it right after Labor Day” is, frankly, not a plan; it’s a liability. That’s because not allowing sufficient time for quality analytics, creative and targeting can spell underperformance not only for your year end campaigns, but for your entire annual program too. As a rule of thumb, allow at least three months for campaign development (although development time can be much longer for large-scale campaigns). For a year end campaign launching November 15th, here are seven things you should put on your immediate “to do” list to ensure that your carefully crafted campaign receives the attention and response your organization deserves. 1. Organize and analyze essential data. Roll up your sleeves and look at your data every which way to plan your year end strategies. For starters, what are the giving trends among your prospects, members and donors, by significant types and segments? What does this suggest in terms of year end fundraising strategies and message differentiation? Also, what does your body of testing data point to for year end strategies, and what new tests do you need to conduct? Take a closer look, too, at what factors have contributed to your year end fundraising successes in the past. How can you replicate them this year? Start mining critical data now in order to shape meaningful year end strategies. 2. Collect information and ideas from all departments. Gather key development, membership, program and communications staff to review organizational priorities and program happenings, and brew ideas for fundraising and constituency-building. Whether that means a meeting of ten people, or two, it’s important to develop campaign ideas collaboratively, across departments. 3. Determine how much you need to raise. You already have specific goals for your year end efforts in your campaign plan, but if your overall program isn’t performing according to plan, you may need to modify your year end goals. Is your program performing above or below goal? Do you need to make up a shortfall, or build on success? Get a solid handle on where you stand relative to your annual goal, and shape your strategies accordingly. 4. Define your target audiences and approaches. What audiences do you wish to reach in your year end campaigns and how should you differentiate your approaches in terms of media and messaging? You may, for instance, communicate one way with low dollar members, another way with high dollar contributors, and an entirely different way with prospective donors. 5. Book your vendors. For agencies, copywriters, designers, mail houses, telemarketing firms and other service providers specializing in fundraising, the fall is like tax season for accountants. Everyone gets incredibly busy. Some don’t even take new clients after Labor Day. Avoid coming up shorthanded in your year end campaigns and book your key vendors early. 6. Develop a contingency plan. If, like most organizations, your year end fundraising revenue makes up a significant portion of your annual goal, you should have a backup plan of action in the event your year end campaigns don’t perform according to plan. This is another reason to start early on your campaigns. For instance, if you don’t launch your year end campaign until the second week in December because you fell behind schedule, then if your campaign is anything less than you expected, you have no time to address it before the end of the year. 7. Read up and reflect. Take time to think about what’s going on in the world – from serious news to pop culture – and think about what may be on your donors’ minds. Unemployment is 9.6%. The Dow fell below 10,000 again this summer. BP spewed oil into the Gulf for 87 days. And a flight attendant stormed off the job earlier this week and Americans mentally high fived him. Think about the significant threads of culture and current events shaping your donors’ perspectives, and how you might shape your year end campaigns accordingly. So get started today and you’ll be in great shape for your year end campaigns. One last Bonus Tip: to really drive home the three-month lead time rule of thumb for your campaigns, keep a “Donor Time” Calendar set three months ahead within daily view of your workspace. Your Donor Time Calendar will serve as a daily reminder of what campaigns you should be developing today, to reach your donors three months from now. How are you planning for your year end fundraising success today? We want to know! Post your tips and ideas here. 1. Hold your Q3/Q4 interdepartmental strategy session. With the second quarter well underway, it’s time to start planning for Q3 and Q4 membership and advocacy campaigns. Assemble all the key program, marketing, communications and development people in your organization and hold a “blue sky” session on upcoming issues and how to talk about them with your members and prospects. Don’t worry about logistics and implementation (that’s next month). Just focus on ideas and “what ifs” for now. 2. Fine tune your FY11 membership plan. By now you have a solid draft of your campaign plan and budget for the new fiscal year. Continue collecting data, pricing and information to fine tune your FY11 performance goals and budgets. 3. Schedule interviews with prospective new vendors. By now you’ve also received proposals in response to any new vendor RFPs that you circulated last month. Review the proposals and schedule presentations with your top candidates for next month, with an eye toward selecting new vendors (or deciding to stay with existing ones) by the end of May. 4. Continue to monitor progress toward fiscal year end goals and adjust strategies if needed. If it looks like you’re not going to meet your fiscal year end goals, it’s not too late to do something about it. But the key is spotting problems now. If, by the end of April, you’re not on track to meet your fiscal year end goals, it’s time to rally a corrective campaign. Stay tuned for your May strategic planning tasks from us next week. And if you haven’t signed up already, be sure to register for the AFP’s Fundraising Day in New York on June 11 and the AFP/DMAW Bridge Conference in DC July 26-28 – and stop by my sessions on membership development and donor-centric communications. Hope to see you there! Draft your campaign plan for the new (7/1) fiscal year. Because you’ve spent the last several months analyzing your donor file and identifying your key priorities for the new fiscal year, you’ve already done the hard work. Now focus on the details: the specific campaigns, media mix, calendar, goals and expense budgets. 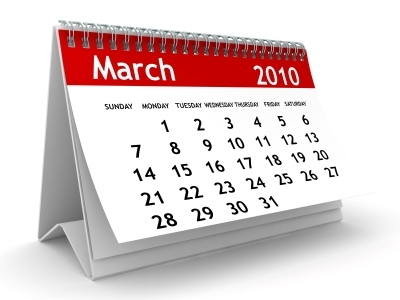 Get a solid draft hammered out this month, and you’ll work on fine tuning it next month. Assess your allocation of staff resources to your campaign plan. Do you have enough resources to implement your new plan? Do you need to bring on additional resources to implement the plan successfully? This is the month to answer these questions and start thinking about identifying additional resources if needed. Discuss updates to vendor contracts and/or distribute RFP’s for new vendor services. If your program relies on annually contracted services, you should begin renegotiating contracts or, if applicable, soliciting proposals from potential new vendors this month. Monitor progress toward your fiscal year end goals and adjust strategies if necessary. With all this looking ahead to the new fiscal year, don’t forget to keep close tabs on the one you’re in now. Are you going to make goal? If it looks like you might not, you should begin rapid planning for and implementation of corrective strategies. We’ll be back in touch with your April strategic planning priorities soon. And if you have questions or comments in the meantime, post them here! This month comes in like a lion in more ways than one. For organizations with July-June fiscal years, March is the most intensive month of the annual strategic planning calendar because, among other things, it’s when you’ll complete the analysis portion of your annual State of the Donor File evaluation. This means distilling the hundreds of pieces of data you’ve been collecting over the past two months into a dozen or so key observations about your organization’s donor giving trends, deciding what the trends mean and, more importantly, what you’re going to do about it. The number of donors giving to your organization. Is your donor file growing, shrinking or staying the same? The number of donors that have lapsed in their giving to your organization. We know that donors lapse but how many did your organization lose in the last 12 months? Are your donors lapsing at a lower or higher rate than they did last year? Donor loyalty. How frequently are donors giving to your organization? What’s the breakdown of first-time donors to multi-donors, and what trends do you see from year to year? Donor generosity. Are your donors giving more, less or the same? Is it a matter of more donors giving smaller individual amounts, or fewer donors giving more? Upgrading and downgrading. What percentage of donors are increasing or decreasing their giving to your organization? How many donors upgraded to major gift levels? New donor conversion. How long does it take a new donor to make a second gift to your organization? What percentage of first-time donors never make a second gift? Giving channels. What giving channels (i.e. direct mail, email, web, canvassing, telemarketing, etc.) yield the most donors? The most contributions? The highest gifts? How does donor loyalty differ by channel? Acquisition cost recovery rate. Most organizations acquire new donors via direct response channels at a cost which is recovered over time. How long does it take your organization to recover its initial acquisition investment in a new donor? New donor sources. What are your primary, emerging, and waning sources of new donors? How does initial and subsequent giving vary by source? Special programs. 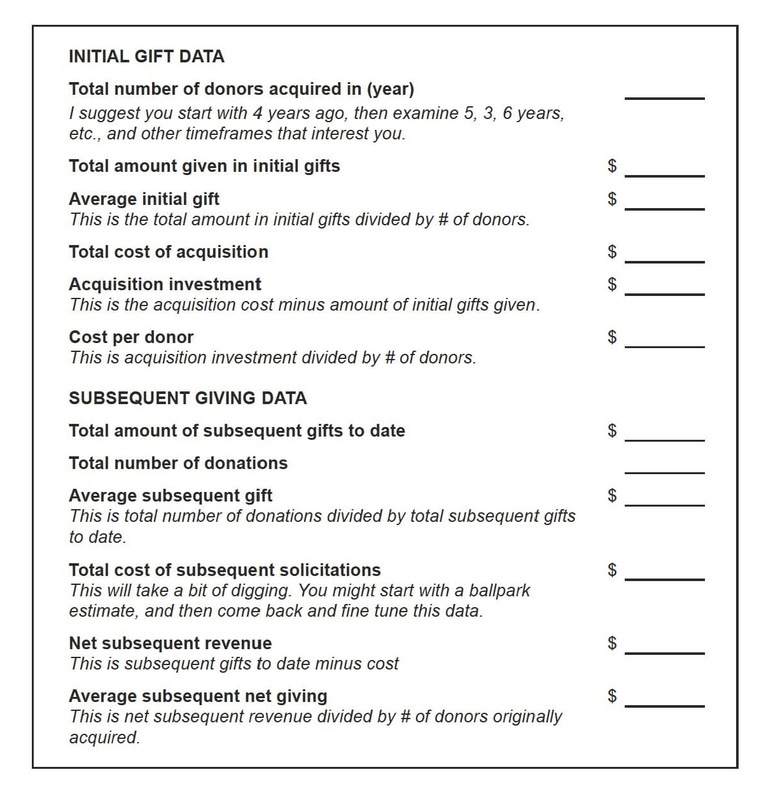 What are the acquisition, attrition and giving patterns for monthly donors, major gift club donors, etc.? In addition to studying these and other file characteristics, you should examine the reasons for all of your findings. For instance, if your donor file is shrinking, you need to determine why. Don’t just probe your disappointing findings though. If you find that something is doing well or better than expected, ask why too – perhaps you can expand on that success. You should also address how your findings track with the strategic priorities you established last year for your current program. If one of your organization’s strategic priorities was, for example, to retain a higher percentage of donors, did you? Finally, with your newly acquired knowledge and understanding of your donor giving trends, it’s time to make a list of strategic goals for the new fiscal year. What problem areas did you find that you want to address? What’s working well that you want to keep doing? Your strategic priorities will be unique to your organization, but no matter what is on your list be sure to keep it realistic and keep it short – 3-5 major priorities maximum. You still have a few more important strategic planning tasks this month. But seeing as you’ve just completed a major donor file analysis and strategic priorities for the new fiscal year, I think you deserve to take the rest of the day off. So check back next week for the rest of your March strategic planning to-do’s. And if you have an idea to share for Fundraising Day in New York, don’t forget to email it to me directly or submit it via the comments section. Looking forward to hearing your thoughts! 1. 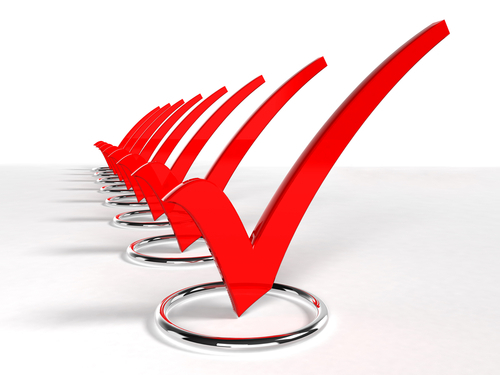 Finish data collection for your State of the Donor File evaluation and start analyzing. You’ve given yourself a full month (January) to collect the raw data for your annual file analysis. Now take February to really study it and get a clear picture of what’s going on with your donors. Are fewer donors giving more to your organization or vice versa? Is your ratio of direct mail to online giving changing? What are the trends among your monthly donors? To what degree are donors lapsing and how successful are your reinstatement efforts? Write down everything you see in the data. Next month you’ll decide what your observations all mean relative to your overall vision for membership and plan strategies accordingly for the new fiscal year. 2. Evaluate vendor partnerships and contracts. Sit down with your internal team and review your key vendor partnerships (agencies, analytics resources, freelancers, printers, etc.). Take a close look at how well your vendors are performing relative to your goals, and how well the relationships are working. Are you meeting timelines, budgets and goals? Are your communications and workflow processes running smoothly? If there are any problem areas, explore possible causes, including the role you may be playing, and how improvements may be made. Just as importantly, examine what’s working well in your partnerships so that you can be sure to keep doing it. If your review process points to a less-than-ideal vendor partnership, you will need to discuss the issues constructively with your vendor partner, and possibly even explore alternate partnerships. But we’ll talk about that in a future post, because ideally, you’ll find your partnerships on solid footing, in which case the main focus of your internal vendor review should be the relationship for the new fiscal year. 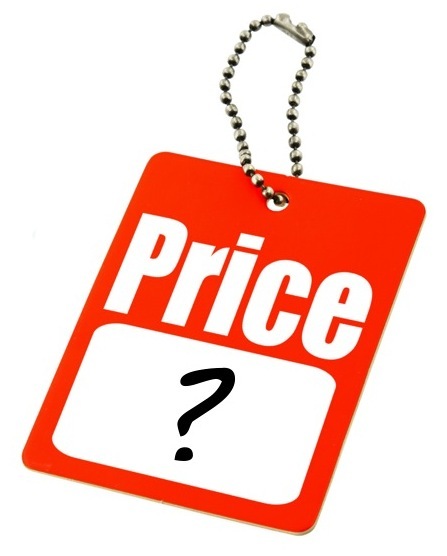 Are there budget constraints you need the vendor to help you address? New services you want to explore? Modifications to existing processes you’d like to make? Special challenges you want the vendor to help you meet? Once you have completed your internal reviews and have a clear vision for your vendor partnerships in the new fiscal year, schedule meetings with your key vendors to begin working on plans and budgets. 3. Forecast your year end results and plan course corrections if necessary. With all this looking ahead to the new fiscal year, don’t forget your current one. Are you going to meet goal? With year end gifts fully entered and reconciled, by now you should be able to answer this question. If it appears that the answer is no, the good news is you have 5 months to fix it. The saying “content is king” has long been a dictum of web design, referring to the importance of desirable, engaging information to a website’s success, as recently affirmed in this CNET report. But in nonprofit membership and constituency development, it’s strategy – not content (or message for that matter) – that rules. Don’t get me wrong; content and message are hugely important. But if your message, not guided by strategy, doesn’t get to the right people, doesn’t elicit the right response, or simply doesn’t get noticed, then you’ve accomplished nothing. Who would have thought that our powerful new communication channels and techniques would also have the power to cause mass amnesia when it comes to the basic tenets of membership development and marketing? The fact is, to truly be on the cutting edge of membership development, you don’t need to be a direct mail, social media, telemarketing, DRTV or mobile media expert, because those are just the tools. What you need to be is a strategist. Ask yourself these questions often, and your inspired messages and original use of the tools available are sure to follow. The simplest things can escape us sometimes. We get so involved in the details of inspiring people to make donations to our organizations that we forget about our donors themselves. We can tell you how our programs our doing. We can tell you our average gift, percent response, open rate, cost to raise a dollar, unsubscribe rate, net/M, and so on. But ask us how our donors are doing and we’re stupefied. Um, fine? Do you know how many gifts on average your donors make to your organization within 24 months of their first gift? Do you know if this number has stayed the same over time, has increased, or has decreased? Do you know how many major donors your general membership program yielded last year? Is it more than in previous years or less? Do you know which sources of new members to your organization yield the highest value members up-front? Which sources of new members yield the highest value members over time? Are they the same sources or different ones? If you don’t know where your donor file has been, or where it is now, how can you set goals and strategies to guide where it’s going? So before you create another annual membership plan in the dark, shine a light on your donor file and shape your strategies for your next fiscal year around your vision for where you want to go. Set aside two weeks a year to conduct an in-depth annual donor file analysis. Schedule your annual donor file analysis to happen about a month before you need to start creating your annual fundraising plan and budget. Articulate your findings and interpretation of your donor file analysis in a formal document. It doesn’t have to be anything fancy; simple bullet points are fine. Use what you find in your annual donor file analysis to shape your membership strategies and budget for the coming fiscal year. For instance, if your donor file analysis reveals less than stellar member renewal rates, plan strategies to improve your renewal rates and integrate them into your membership plan for the coming fiscal year. Repeat annually and refine your strategies as needed. Finally, keep in mind that your annual donor file analysis isn’t just for identifying what you’re doing wrong so you can fix it. It’s also for identifying what you’re doing right so that you can do more of it. How do you track donor trends in your own program? Share your comments and experiences here. And if you’d like a list of startup questions to get you going on your own donor file analysis, just drop us a line at topics@nthfactor.com. In direct response fundraising, “membership” in an organization is often a symbolic donor status, but a highly effective means of articulating and cultivating donor relationships. A donor is someone who makes a gift, but a member is someone who belongs. Membership conveys a sense of community, a basis for annual renewal and a framework for upgrading via membership levels. So depending on the type of organization you are, talking to your donors as “members” can make good fundraising sense. Though I believe that a membership program would be a good strategy for this particular organization, the Board was right to be hesitant. They didn’t have enough information to make an informed decision. And no matter how urgent your deadline may be to create a new giving form (as was the case with this organization), creating your membership brochure before you’ve created your program is like putting the cart before the horse – it doesn’t work. Every good membership program starts with a well thought-out plan – a formal document that articulates the program’s purpose, objective, goals and operating details. But a membership program only becomes reality – and succeeds – with organizational understanding of and buy-in to the program. So thanks for a great question Jane! Have an experience with membership program development to share, or a question of your own? We want to hear from you! Email topics@nthfactor.com.